We’ve warned investors about the likelihood of further downside in oil prices and tried to steer investors away from the sector’s riskiest areas for more than a year. 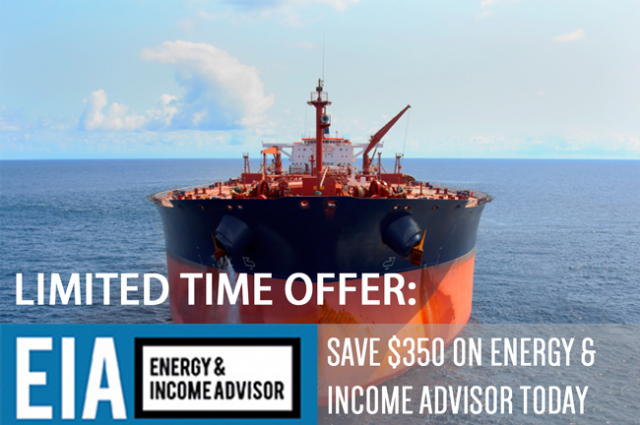 Energy & Income Advisor subscribers sold popular offshore contract driller SeaDrill (NYSE: SDRL) in fall 2013, a call that we shared with non-subscribers in Why SeaDrill Still Rates a Sell (April 2014) and reiterated in Five Myths about SeaDrill That Could Cost You Real Money (October 2014). These calls proved prescient: In late 2014, SeaDrill eliminated its dividend; the stock now trades for less than $7 per share. We also sold Hi-Crush Partners LP (NYSE: HCLP) for a 60 percent profit in April 2014, near the height of the market, and repeatedly warned readers that the stock was poised for a big fall. In early November 2014, we felt so strongly about the growing risk that we posted a free article on our site urging investors to sell Hi-Crush Partners and Emerge Energy Services LP (NYSE: EMES) before the bottom fell out. (See Sand in the Gears: Elevated Downside Risk for High-Flying Proppant Producers.) Since then, these stocks have given up an average of 60 percent of their value. Several readers have asked for our updated outlook for oil prices and energy stocks. In the near term, there’s a risk that a wave of short covering could drive a short-lived rally in oil prices. Data from the Commodity Futures Trading Commission indicates that hedge funds and other institutional investors have shorted the equivalent of 160 million barrels of West Texas Intermediate via futures contracts. As recently as mid-June, this aggregate position stood at less than 60 million barrels, indicating that institutional investors have shorted the commodity aggressively over the past two months. These funds sit on huge gains that they’ll want to turn into real profits at some point. Remember, these funds tend to make shorter-term bets and are tourists in the energy sector, not full-time residents. To book a gain on a short position, a trader must buy oil futures; this massive short interest represents a wellspring of pent-up buying power. Any hint of good news—for example, a better-than-expected inventory report or further signs of declining US oil production—could catalyze a wave of short covering and a sharp snapback in oil prices. However, elevated oil inventories and the transition from summer driving season—a period of peak demand—to a period when refiners usually idle some of their capacity for upgrades and maintenance suggest that any rally will prove to be short-lived. Do not confuse this oversold bounce with the start of a V-shaped recovery in oil prices. Investors should regard this rally as a last chance to exit riskier positions; all signs point to oil prices and energy stocks suffering further downside this fall. It’s tempting to buy the dip in high-quality stocks that have pulled back significantly from their 2014 highs. Every week, readers ask how energy-related equities can fall much further. Our calls for oil prices to drop to $30 per barrel met a lot of skepticism in late 2014, and we received some hate mail when we urged investors to sell SeaDrill, Hi-Crush Partners and other high-risk names. Investors also shouldn’t overlook the growth stories on the natural-gas side of the business. Although North American natural-gas prices have also plummeted over the past year, an extended period of depressed prices has helped to stimulate demand growth. The Environmental Protection Agency’s (EPA) final rules on carbon dioxide emissions from power plants favors the retirement of coal-fired capacity and growing demand for baseload generation from gas-burning plants. America’s abundance of inexpensive natural gas—not advances in renewable energy—made this scenario possible. The demand outlook for inexpensive US natural gas also looks rosy south of the border. Mexico’s domestic natural gas production has flattened and looks set to decline, forcing the country to rely on imports to meet growing demand. Mexico’s state-owned power company also plans to more than double its generation capacity over the next 14 years, with gas fired power plants accounting for the bulk of these capacity additions. The start-up of facilities to export liquefied natural gas (LNG) over the next several years will contribute another demand outlet, though the severe downdraft in Asian and European LNG prices raises questions about utilization rates in the near term. I recently recorded a Free Video explaining our outlook for crude-oil prices and the risks and opportunities in the energy sector. Before you buy another energy stock, I urge you to review the content of this video. The Energy Sector’s Endangered Dividends A Bull Market for Brazen Forecasts Leaders and Laggards Income Investors: How Much Energy Should You Own Now?